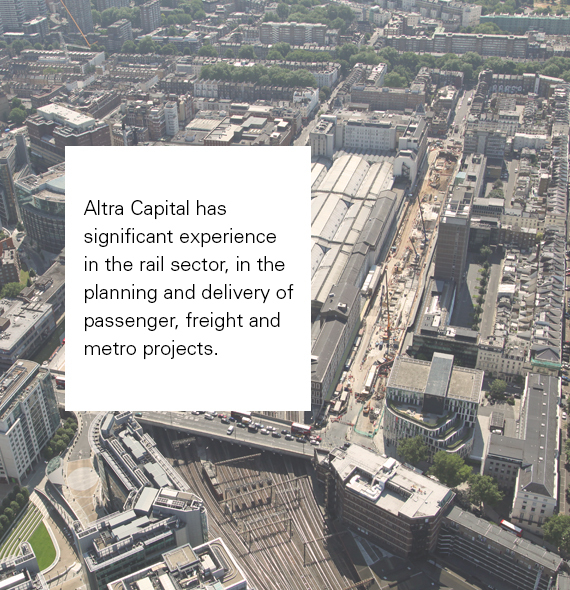 Altra Capital’s senior management has significant experience in the rail sector including passenger, freight and metro projects in China, North Africa, Europe and the UK. Our Managing Director, Geoff Maynard, has extensive experience of specifying and designing new lines, having led the British Rail team specifying Crossrail, the new cross-London route, and the new Thameslink services, both under construction. He led teams examining operation and design issues on the now completed Channel Tunnel Rail Link, and the proposed southern link to Terminal 5 at London Heathrow’s airport. He also has a great appreciation of heavy freight transport in the United Kingdom, having led the rail teams moving coal in the North of England and Scotland, and also the Iron and Steel operations nationally. Geoff is recognised as an expert in the sale and acquisition of infrastructure assets.